The first time I heard of quinoa was one day when my friends Lillian and Dan came over, the topic of quinoa was brought up during our conversations. They gave me some ideas for cooking quinoa. So I decided to try it out. Quite honestly, I didn't find quinoa tasty at the beginning. Perhaps I wasn't quite used to its texture. However, the more I eat, the more I enjoy it. Now quinoa has become our regular side dish, and I am always interested in finding different ways of cooking it. Drain well in a fine metal strainer. Set aside. Pour chicken broth into a pot. Add quinoa to the broth. Cook uncovered. Bring to a boil. Turn the heat down to low. Cover and simmer for 15 minutes. Remove from heat. Let sit and remain covered for 5 minutes. Heat 2 tablespoons of olive oil in a pan over medium heat. Saute onion and mushrooms until tender. Add corn, sweet peas and cooked shrimp and stir well. 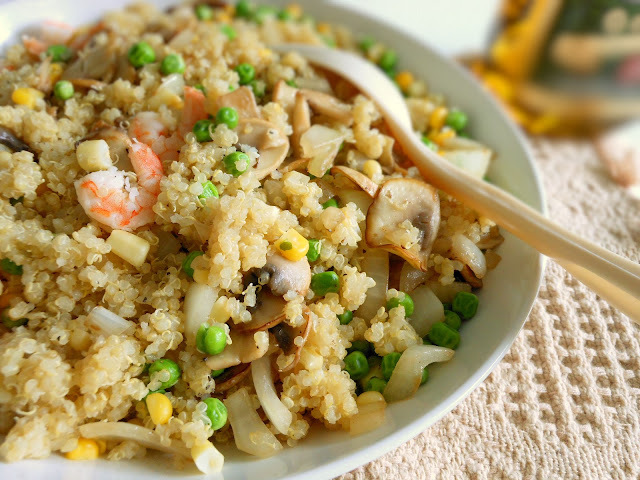 Mix all the ingredients with quinoa. Transfer quinoa to a serving bowl and serve.